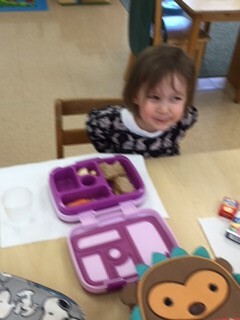 As our Toddler teacher pointed out this week, more of our younger students are staying at school and eating lunch with their friends. Many of our older children are with us all day and eat lunch every day. Our focus during lunch is promoting independence and allowing children to take care of their own lunch needs, from unpacking their lunch box, to opening all their containers, to feeding themselves. Often when packing lunches, we do not think about those things and may be more concerned with quantities and choices. At Westmont, we encourage the use of proper utensils and cloth napkins daily. For our younger “lunchers” they need more time, patience and practice to achieve self- sufficiency. 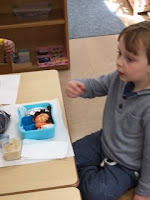 Practicing using utensils at home, as well as opening and closing containers will support greater independence in school. Using utensils and drinking from real glasses encourages proper oral motor development, and proper formation of sounds that are yet to emerge. Did you know that there are some sounds that do not fully emerge until the age of 7? As I sit with children for lunch, observe a lunch period, or visit our Kindergartners for lunch weekly, I see the level of independence increase with age, practice and expectation. I am impressed by the great choices children have for lunch because, let’s face it, we know children can be picky eaters. Many parents worry that their children are eating enough nutritious and tasty foods. Quite often children like foods that are easy on the palate and they look for the same food repeatedly. At lunch I sometimes hear children say, “I don’t like this,” and refuse to eat it. It takes patience and strategy to get children to eat a wider range of nutritious food. One of our nutrition speakers, who presented at the school, informed us that it can take over 20 tries/attempts of a new food for a child to add a new food to his list. This takes a lot of patience on a parent’s part. What can you do to support healthy eating habits? I love this list to pick something from each category! An idea you can look forward to, and possibly start incorporating relatively soon! I find this pretty inspiring… this blog has a bunch of seasonal ideas!